This eco-friendly dehumidifier silently and reliably protects clothes and valuables from mold, mildew and moisture. The unit lasts 20-30 days before renewing. Special features of the E-333 includes: the unit works in areas up to 333 cubic feet, requires no batteries or cords for use, is 100% renewable, works up to ten years, is compact/silent, always spill and mess free and is non-toxic, child and pet safe! – Small closets: Eva-Dry prevents damage to fabrics and musty odors caused by excess moisture. – Plastic Storage Containers: Absorbs musty odors, and prevents damage caused by excess moisture on stored seasonal clothing. – Cabinets: Protects stored food from damage caused by excess moisture. – Under sink: Keep the under sink area dry and mold free. 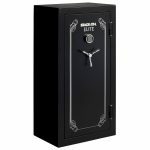 – Safes: Protect your valuable pictures and important documents from damage caused by excess moisture. This eco-friendly dehumidifier silently and reliably protects clothes and valuables from mold, mildew and moisture. The unit lasts 20-30 days before renewing. Special features of the E-333 includes: the unit works in areas up to 333 cubic feet, requires no batteries or cords for use, is 100% renewable, works up to ten years, is compact/silent, always spill and mess free and is non-toxic, child and pet safe! The unit measures 6 1/4″ L, 1 ź” W, 4 ž” H.
– Bathrooms/Laundry Rooms: Eva-Dry absorbs excess moisture form vapor related activities, and helps dry fabrics faster. – Bedrooms: While absorbing excess moisture you are also reducing dust activity, and consequently the risk of allergies. – Basements: Protects stored clothing and tools from damage caused by excess moisture. – Offices/Supply Closets: Protects electronic equipment, supplies and paper from damage caused by excess moisture. – Gym Lockers: Absorbs odors and dries wet gym clothes faster. – Musical Instruments: Prevents damage caused by excess moisture. 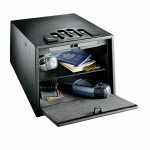 – Gun Safes: Prevent rust to guns and expensive ammunition and other damage caused by excess moisture. 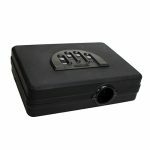 – Safety Deposit Boxes: Protect your valuables and documents from damage caused by excess moisture. 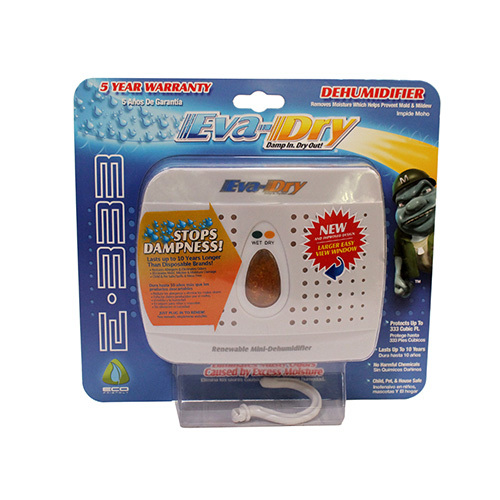 Be the first to review “Eva Dry Mini Dehumidifier” Click here to cancel reply.